Howden produces complete custom-designed ventilation, cooling and heating systems for mining applications throughout the world. The company manufactures and installs centrifugal fans, fixed and variable pitch axial fans, mixed flow and auxiliary fans, as well as a full turnkey service from design to commissioning. Many of the best known names in mine ventilation are now included in the Howden organisation, including Alphair Ventilating Systems and TLT Babcock. The company can provide spares, support and upgrades for virtually any main ventilation fan anywhere worldwide. Howden understands the rigors and demands its equipment will be subjected to by mining applications, as well as the technologies and economy of the industry. The company has a working knowledge of various regulatory environments and best practice guidelines from different countries, and its experience covers some of the deepest, coldest and most remote mines in the world. In addition to fans and associated heating and cooling systems, Howden supplies ancillary products such as dampers, controls and instrumentation, ducting and drives, including highly efficient fluid drives. The company can organise and manage your entire project from civil engineering groundwork to the handover of a fully tested installation, or simply deliver products for your own engineers to install. Howden’s experience, engineering skills and constant investment in research and development enables the company to make fan and ancillary equipment of exceptional energy efficiency and reliability, and outstanding cost-effectiveness. The company has a proven record of significantly reducing lifetime operating costs for mine operators. Howden is committed to providing a full aftermarket service to keep installed equipment running efficiently for as long as possible, and increase productivity and profitability. Its support ranges from troubleshooting expertise to manufacturing spare parts from original drawings to obtain absolute accuracy. The company also offers a service to keep customers informed of new developments and technologies that could bring additional energy cost savings. Sometimes changes in a mine or the market’s demand for its products mean that a ventilation plant no longer matches its duties. In other cases, technological advances in impeller aerodynamics or drives make a more cost-effective option available. Whatever the reason for an upgrade, Howden engineers will provide detailed, costed proposals that set out the capital outlay and running costs so that properly informed decision can be made. Planned preventative maintenance that minimises downtime is achieved through a working partnership. Howden works with all types of mines, tailoring its support to their specific needs and circumstances, drawing on a wide spectrum of service options to provide the right package for each individual situation. These packages include elements such as onsite investigations and diagnostic tests to establish the condition of bearings and impeller blades, and to monitor noise and vibration levels. The company can also advise clients on the spare parts it would be beneficial to store onsite. The right level of intervention is the one that maintains safe, reliable working at minimum cost. Howden was established more than 160 years ago and has grown into a global business with bases in 27 countries throughout the world. The company’s success is built on the foundations of system applications knowledge, outstanding engineering and unequivocal dedication to service. Today, in addition to recent acquisitions including Alphair and TLT Babcock, the Howden organisation also incorporates respected names such as American Standard, Buffalo Forge, Canadian Blower, Flakt Woods GII, Gyrol® Fluid Drives, Joy Green Fans, Novenco® and Solyvent. 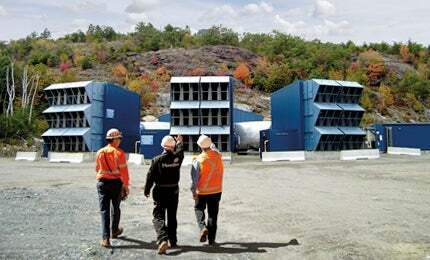 Howden’s worldwide presence has boosted the company’s in-depth knowledge of different types of mining operations. It has also enabled it to build close working relationships with customers and provide an efficient local response when required. For more information about Howden could improve your operations and a no-obligation assessment of how it could improve your efficiency and cost-effectiveness, please use the enquiry form to contact your local Howden representative.